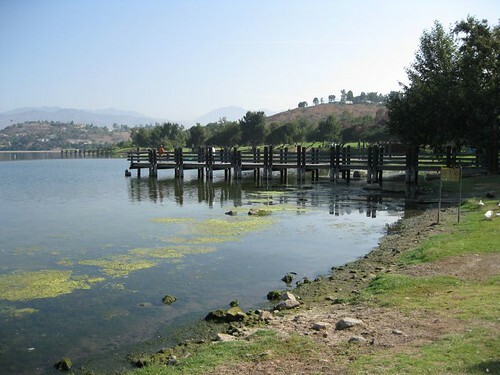 This morning I drove out to the Frank G. Bonelli Regional Park in San Dimas, CA to try out a bike route I had found online. 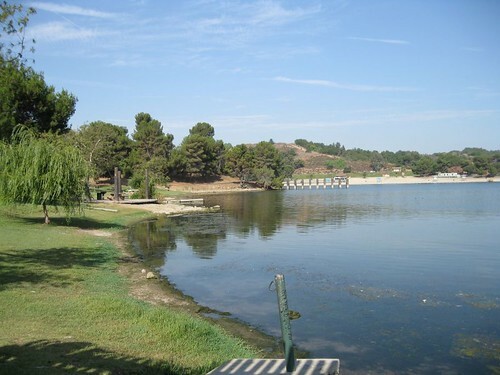 I had gotten the impression from the site (Bike Paths of Los Angeles) that there was a path completely around the reservoir. Actually, you have to go in and out of the park to go completely around, and much of the way you are quite far from the lake. When I ended up at the fairgrounds, I thought I had gone completely wrong, but in fact I was on track. I turned around and headed back for the park. Next time I will pay a bit more attention to the map before starting out. To get there, I took the 10 freeway west and got off at Via Verde, just at the top of Kellogg Hill. I took Via Verde away from the Forest Lawn cemetery. There is a Park and Ride lot just before the entrance to the 57 freeway. It is best to park there to avoid paying $8.00 to enter the park. They don’t charge bicyclists or pedestrians an entrance fee. Bonelli Park is good place for biking, and there were lots of bicyclists. There are some hills that were a bit tough for my seven speed. I got half way up the worst one in first gear and then I had to walk. That might have been because I could be in better shape. I find that biking once a week is not enough to improve endurance significantly. I probably need to supplement my weekend activity with some time on the stationary bicycle. The Dahon Speed D7 folding bike is working out very well. I don’t have to worry about putting a rack on my car, and I don’t have to struggle to put a full-size bike in the back of an SUV. It fits in the trunk of my 2003 Civic. People in full biking regalia on bigger, more expensive bikes with more gears routinely fly by me, but that’s fine with me. I am having a fine time. I did recently buy a new helmet, however. When I first started, I bought a black Bell Triton Fusion, which was comfortable and fit well. It was fine when the weather was cool, but black is the wrong color to wear in the heat. It leads to baked head syndrome. So I bought another Bell Triton, in white and silver. It makes a big difference. Now I have a cool-weather helmet and a hot-weather one. This entry was posted in Bicycles and tagged folding bicycle. Bookmark the permalink.